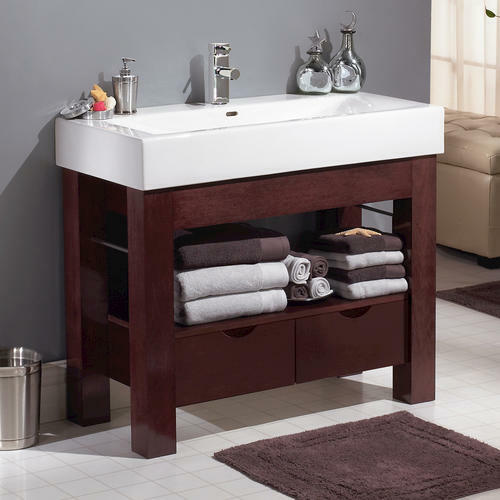 There aren’t a lot of options out there for ADA compliant vanities. Most are wall-mounted, which I didn’t want. They’re also very expensive. 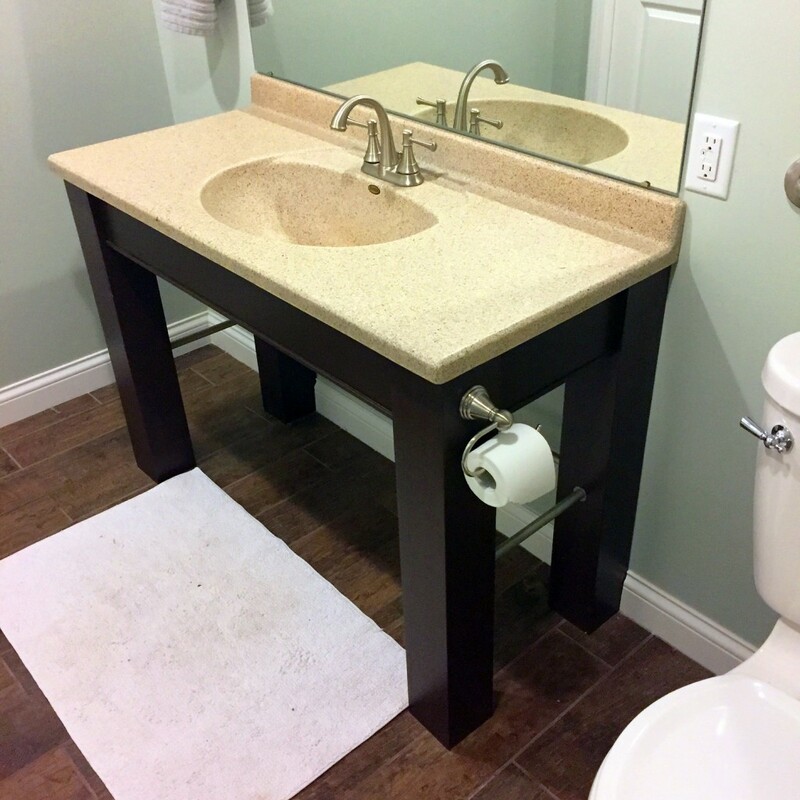 I wanted an ADA compliant vanity that would look have legs, but still accommodate a wheelchair under it. The best part? It’s exactly what I wanted, at a fraction of the cost. For me, all builds start with a good bit of planning. I found inspiration from a vanity I had spotted at Menards. I liked the chunky look of the legs, but planned on having a wider unit, and it couldn’t have a shelf or drawers, of course. In SketchUp, I designed everything to get a better feel of how it would turn out, and how it would be assembled. 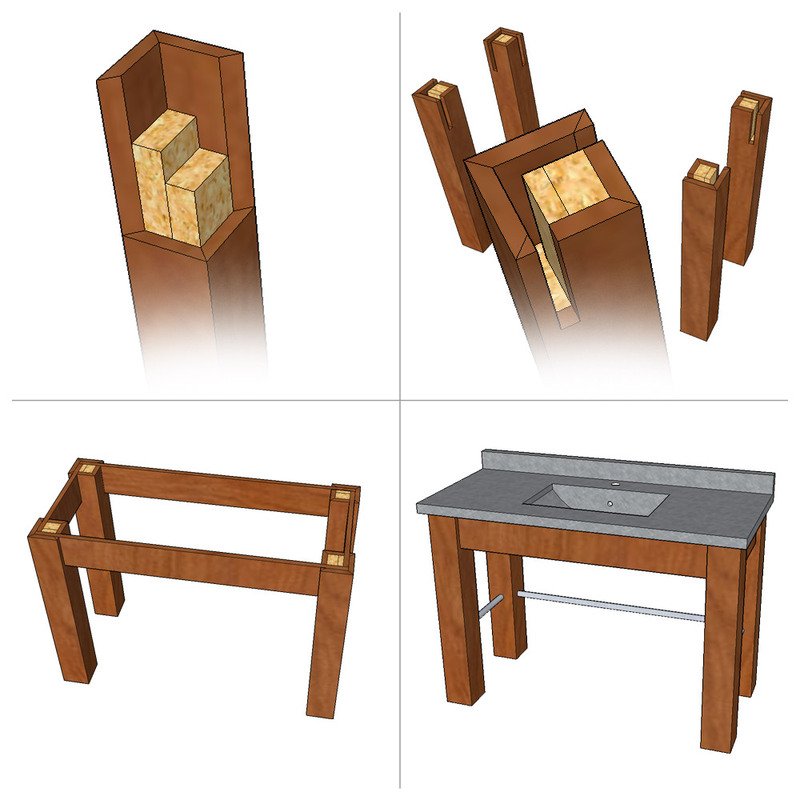 Projects like this are super easy and quick to build in SketchUp; no complex shapes. 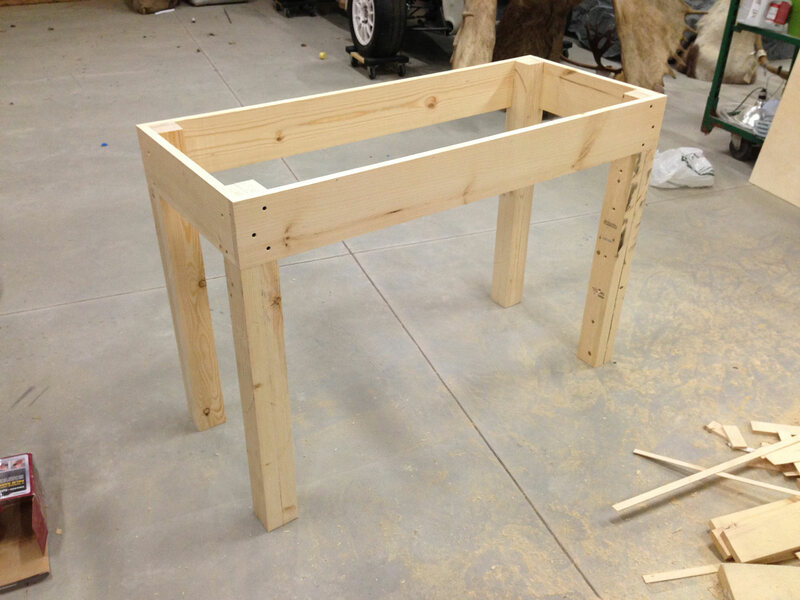 The inside portion of the legs would be made of standard 2x4s. Two were laminated together, then ripped to 3″ x 3″ on the table saw. This would provide the front, rear, and side fascias something to attach to. Each of the legs would be sheathed with 1x stock, which will give the unit the meaty legs I was looking for, and an overall width/depth of 4.5″. The legs are 32.5″ tall, and the fascias are 5.25″ tall. This provided about 27″ clearance underneath after adding a 1/4″ decorative molding to the bottom of the fascias; plenty for any wheelchair. After the skeleton was created, it was time to make the outside portion of the legs. Again, these were made from 1x stock, which is really 3/4″ thick. Each was ripped to width and mitered all the way down both sides. This is where it got a little complicated. My design called for aluminum tubes to connect the sides and rear legs. I ran threaded rod through the legs, then the tubes and cinched them down with nuts on each end. This meant the rods had to go through the 2×4 cores of the legs, as well as the inside of the 2/4″ thick leg sheathing. Then it needed to be covered by the outside of the leg sheathing, so the nuts couldn’t be seen. Whew. After the rods were installed, the remaining outside leg sheathing was glued. 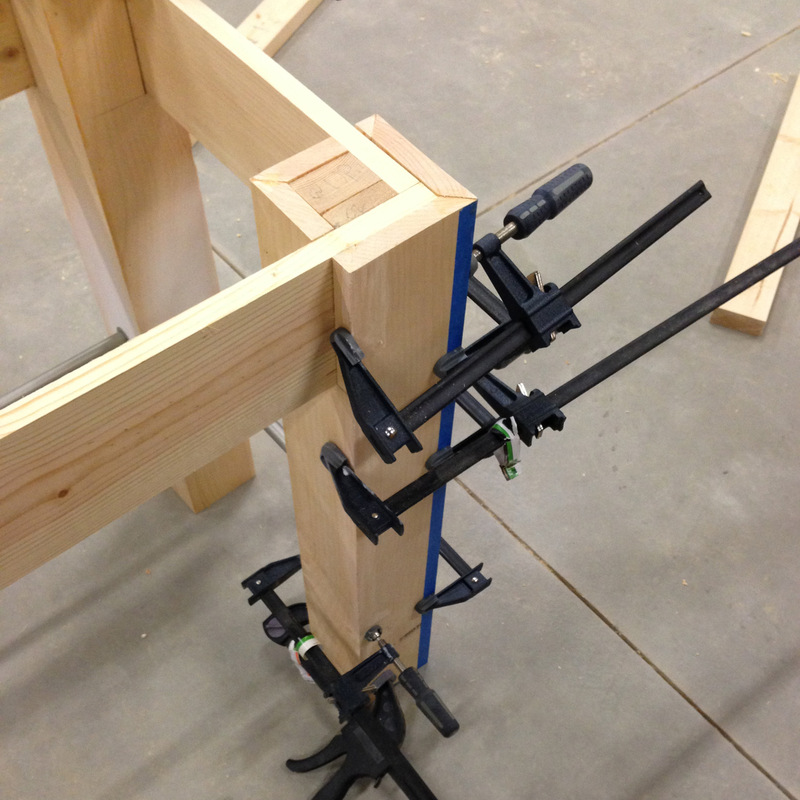 Quick tip – when gluing a miter, tape works amazingly well as a clamp. 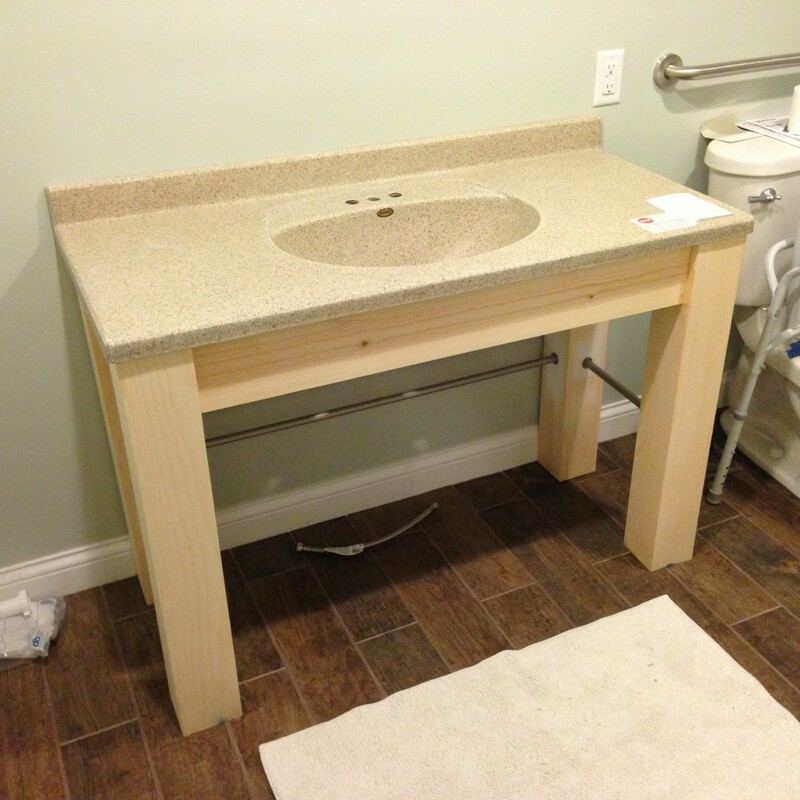 Putting the vanity in place with its top before finishing ensured everything was going to work out as planned. A 1/4″ quarter round was added to the bottom edge of all fascias and the rods were taped off. I had planned on doing a weathered finish with flat white over the brown (which is the reason for paint instead of stain), but it turns out the brown looked so good that I left it! The whole thing was primed, then painted, then cleared with a satin clear. All of that amounted to less than $120 in materials, for a piece that looks like it costs four times that! How do i buy one of these? I am having such hard time finding an ADA complaint sink, and I need it ASAP. Not sure. That’s why I built it!